Bali Restaurant Mangga Madu is a famous restaurant among local people and foreigners, located not far from the center of Ubud. The restaurant is clean, you can enjoy delicious food at zaseki seats or bale. The most popular menu item is ayam keju. It is an original menu item of the restaurant, chicken with cheese inside. 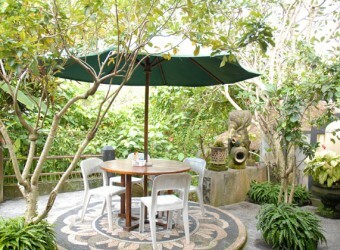 The restaurant also provides nasi campur (Indonesian mixed rice), soto ayam (chicken soup) and other menu items. My First Time Eating at Warung (Food Stall)! My first time eating at warung was at Mangga Madu in Ubud! The seating with sense of freedom in the green nature! !This warung offers Indonesian food, and I think all foods are delicious. I recommend stir fried water spinach! Very delicious. It seems like an open air food stall, but food taste of this restaurant is good. Stir-fried Chinese water spinach is my favorite food, I ordered 2 dishes of stir fried water spinach.